This month, Mark Penfold begins as the endorsing agent for the Fellowship of Grace Brethren Churches. In his role, he works with ordained Grace Brethren men who served as chaplains in the military. This month we are also beginning a regular post by one of our newest chaplains, Cameron Michael, as transitions from serving as a Grace Brethren pastor to active duty chaplain. Cameron is a 2011 graduate of Grace College. Following his graduation from Grace Theological Seminary in 2014, he began leading the Pauling, Ohio, campus of Grace Community Church (Kevin Pinkerton, pastor). Below is this month’s post. To learn more about Grace Brethren military chaplains, see the Eagle Commission. 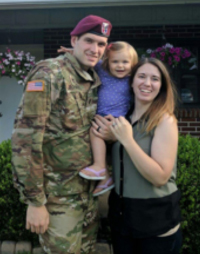 Chaplain Cameron Mitchell, his wife, Kerrie, and young daughter are experiencing military life for the first time. My name is Cameron Michael. I’m 26 years old, married to my beautiful bride, Kerrie, and the father of a one-year-old daughter. Come with me and my wife as we share our journey from pastor to chaplain. There I was, serving as the Paulding, Ohio, campus pastor for Grace Community Church when I felt God calling me to be an Army chaplain. Following months of prayer and paperwork, I reported to Chaplains Basic Officer Leadership Course (CHBOLC) at Ft. Jackson, S.C. in January of 2017. I graduated on Good Friday and a week later reported to the 27th Engineer Battalion (Airborne) at Ft. Bragg, N.C., more commonly known as the “Center of the Universe,” as the home to Special Forces, and the 82nd Airborne Division. As I’ve started the transition from pastor to chaplain, I’ve realized ministry is ministry. People hurt in all walks of life. My first week, I walked with a grieving mother as she lost her child to cancer. I counseled people who were being let go [from jobs] about how to move forward with life. I spent time with the flock God has called me too. Some things are different. I spent most of last week rehearsing a ceremony. There are lots of ceremonies in the Army, and I get to pray at them. It’s great to know God still has some place in the military. When not counseling or in staff meetings (both with chaplains and with other leaders in my unit), my job is to have a “ministry of presence.” This means I get to be with soldiers where they are—doing maintenance on vehicles, at the weapons qualifications range (though chaplains cannot handle weapons), crawling through the mud, and doing all sorts of random other military exercises. I stand alongside the people I counsel. I work with them in their day-to-day routines. Imagine the benefit of going to work with your congregations. For me, this is a reality, except most of these people would never think of going to church, so I have the privilege of taking God to them! Welcome to the life of a military chaplain!